Autumn has come with the fields and mountains turning golden yellow, purple, and red, as in the poem left by Christ Ahnsahnghong. The season of autumn leads us to think about the meaning of our life. In the meanwhile, in celebration of 100th anniversary of the birth of Christ Ahnsahnghong, about 140 pilgrims from 87 churches in 25 countries such as the U.S., U.K., India, Nepal, Philippines, Mongolia, Brazil, Mexico, Ecuador, Peru, and Chile, visited New Jerusalem in Korea. Around October 29, the 72nd Overseas Visiting Group members with professions in medicine, education, science, politics, business, law, finance, filmmaking, dancing, and so on, visited Korea, the land of prophecy. Mother warmly welcomed all the visiting members who flew along like clouds and doves to Korea despite their busy schedules. Mother blessed them so that they could receive much Holy Spirit from Heavenly Father and become great gospel workers who lead many souls to salvation. Along with the Bible study, the overseas members participated in the global forum and the global Bible seminar, and were reminded that they should take part in saving mankind suffering from sins and disasters with the love of God the Mother. They visited the Nakseom Church in Incheon, and Gwanak, Dongdaemun, and Songpa Churches in Seoul, as well as the New Jerusalem Pangyo Temple, following the footsteps of Heavenly Father and Mother who came in the flesh. They also visited the Church of God History Museum to see how the Church has been growing in accordance with the prophecies in the Bible. They were amazed at the beauty of Korean traditions and the spectacular economic growth of Korea, looking around the old palaces and the whole city from the skyscraper observatory in Seoul. They also participated in the dedication service for the Dongtan Church in Hwaseong, and sensed how fast the gospel work is being carried out. Among all the programs, the most special one was the event, which was held at the Okcheon Go&Come Training Institute on November 4 to praise New Jerusalem Mother for Her love and grace. 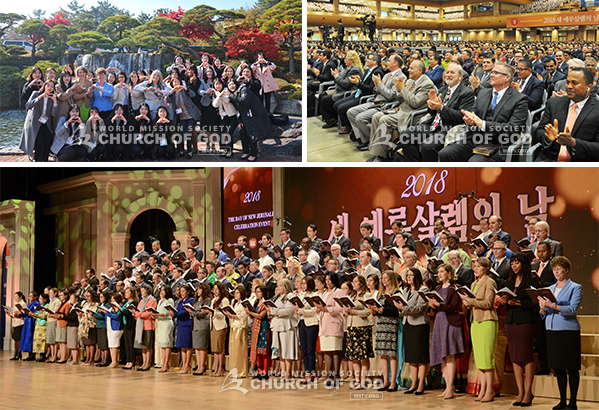 The 72nd Overseas Visiting Group members attended the celebration with around 17,000 Korean members and glorified God with singing in a choir and a contemporary dance performance. The choir of overseas members from 25 different countries received rounds of applause as they sang in unity, having Mother’s love in their hearts. The contemporary dance deeply moved all the members by conveying a message that we can go back to heaven by meeting Heavenly Mother, realizing who we are, and getting our spiritual wings back through Mother’s teachings and sacrifice. “Through the contemporary dance, we felt the warm love of Mother who protects Her children. Although it was a small performance, we were elated to show our dance to Heavenly Father and Mother with one mind,” said Professor Alejandra Daza at a university in Guayaquil, Ecuador, and Ballerina Geoconda Morales, CEO of a dance academy, who showed their contemporary dance. “I was happy all throughout the time I was with Mother. It was full of love,” “I felt the true love of the heavenly family from all the members of different countries,” said the overseas members. Finishing their schedule the next day, they went back to their home countries with the pledge to find all their lost heavenly family members and preach the love of Mother to the whole world.